The right eyeliner for green eyes can make those peepers gleam. It's all a matter of choosing the colors that are perfect for you. Eye makeup for green-eyed individuals is an intriguing collection because it's so wide and varied. There are plenty of options available to the green-eyed gal. A sharp, vivid look can easily be created with rich chocolate brown eyeliner, while a softer look can be achieved with a lighter color. Try these colors and product suggestions to achieve a look that makes your green eyes stand out for miles. When it comes to intensifying green eyes, perhaps nothing does it better than a great plum or violet eyeliner. The purple color is green's opposite on the color wheel and thus creates a sharp contrast that really makes the eyes stand out. Almay Cosmetics has several products for green eyes. Try the intense i-color in raisin for a soft, penciled effect, or for a liquid eye liner, try the intense i-color liquid in raisin quartz. e.l.f. Cream Eyeliner is an alternative choice to the traditional pencil liner. Soft, creamy and easy to apply, this liner is packaged in a small pot and is available in a striking, regal shade of Plum Purple. It's ideal for a dressy night out on the town. Using earth-toned shades is a surefire way to play up those green eyes. Browns, bronzes and similar shades all complement green beautifully, and brown in particular is a great alternative to black, which can be too harsh for daily wear. Urban Decay has a waterproof liquid eyeliner that glides on smooth as silk for effortless application. Try it in Demolition for a sleek look, or have some fun with Woodstock to make a playful statement. Bare Escentuals bareMinerals Liner Shadow is a fresh take on the traditional liner. This loose powder can be worn wet or dry, allowing you to experiment with different looks. Use a light hand to wear the tobacco-hued Coffee Bean, or moisten the brush and go for a dramatic effect. Though there's no dearth of eyeliner color choices out there, the rainbow of eye shadow hues is practically limitless. Using an eye shadow as eyeliner can present you with even greater options when it comes to lining your eyes with unique shades that make your green eyes sparkle. Burgundy: Try enhancing your green eyes with one of MAC's many eye shadows, such as Sketch or Blackberry. These burgundy hues complement green perfectly. Another great partner for green eyes is gray; MAC's Print is a shimmery, subtle gray that looks stunning and makes green really pop. Green: Many shades of green or blue-green can be flattering on green eyes. Try Urban Decay 24/7 liner in Stash, Mildew, or Covet, Nars eye pencil in Kyoto or Kaliste, or Rimmel's Kohl liner in Jungle Green or Green Shimmer. Dust a subtle, yellow-gold highlighter on the brow bone to play up the green without going over the top. Line the outer "V" shape of the eyelid with a burgundy or smoky plum to make the eyes look bigger. If you prefer blacks to browns, try a gilded version, like Laura Mercier's new Black Gold kohl eye pencil. 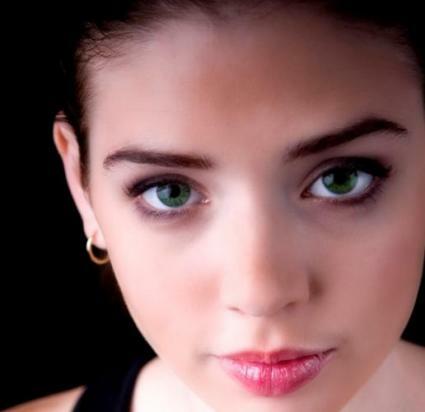 Play up your green eyes with the right colors and you're guaranteed to turn heads. While a great look requires several components to come together flawlessly, almost nothing compares to the enigmatic beauty of perfectly made up eyes. Emphasize your eyes with the right shade of eye liner for your green eyes and complete your look.